Guar gum powder is widely been used in the food industry. It includes different uses like making gluten-free pastries and ice cream. There are various benefits of using guar gum powder in vegans. Here are some of the applications where guar powder is used as vegans. Guar Gum Powder is one of the most potent natural thickeners used in the food. This is the reason why the variety of industries uses guar gum powder. When the guar gum powder is added to sauce it controls the thickness level giving a smooth and silky texture. You can add a ¼ teaspoon and stir it immediately in order to prevent clumps in the sauce. It can also be sprinkled into the salad dressing. For creamy and bean soups, guar gum powder added to soup benefits with its thickening ability. Stir well and mix it up fast in order to prevent clumsiness. Guar Gum Powder is considered a highly efficient agent for perfect baking. It is used for gluten-free and vegan baking. When added with non-wheat flour, it makes your baked goods fluffy and soft. It also helps to increase the shelf life of the dough. Vegas can also use guar gum powder as a substitute for eggs. Noodles are one of the yummiest eateries for all and mostly children. Guar gum powder, when added to noodles, helps to improve the texture as well as the shelf life of the noodles. It makes the process of making noodles faster and easier. Noodles, when boiled, won’t get runny and will be a better choice to eat. Guar Gum Powder in ice cream gives a smooth and creamy texture. Along with this, it also helps to reduce the rate of ice crystal formation. Due to this reason, it is also been used in frozen goods production. Your day starts with your breakfast with your bread and jam. Guar gum powder is the common thickener been used in jams. It helps to increase the consistency of fruit jelly, fruity goodness smoother that will easily get spread on the toast or bread. There are various other benefits for guar gum powder when added to a dish as it is pure water-soluble fiber. Its substance viscosity and thickening properties make it more interesting to be used in the food industry. Along with this guar gum powder has health benefits like it is a great source for fiber, reduces cholesterol level, and stabilizes your blood sugar and various other health benefits. 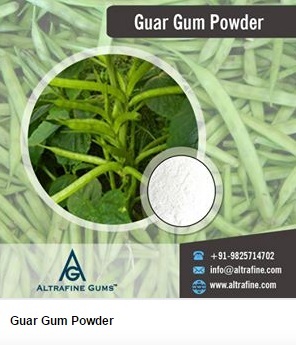 Altrafine Gums offers high-quality guar gum powder that is been used in different industries like food, textile and many more. Along with this, we also provide with fast hydration guar gum powder, cassia tora powder, sesbania gum powder, and many more products. To know more about guar gum powder contact us today and get acquainted about their uses in different industries and also know about our other products as well.